The problem with this set up is that you are trying to fight the bulk of your quilt on the already small throat space of your machine. There are very few walking feet that have a left side guide bar. 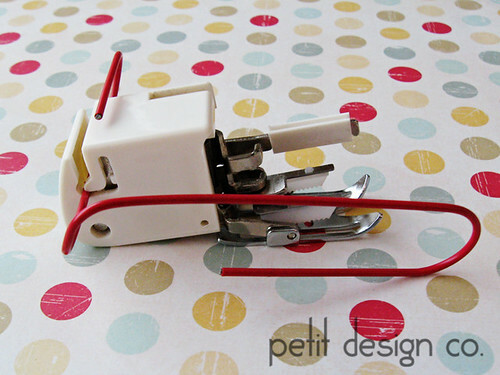 Bernina is one of those that offers a guide bar on either side. If you can find a walking foot that will fit your machine and has a guide bar on the left side, that is the one I recommend. Better yet, if it has a guide for either side that would be ideal. Specialty feet are expensive so don’t run out and buy a new one. I did a little research for you and I found 2 options you might be interested in. Mind you I have NOT tried either one of these items so I don’t know how well they will work. The first one I found was at Thread Stand Hero and is priced at $19.99 (+$4.95 shipping) and is also carried at Keepsake Quilting but is currently out of stock. This one works by attaching to the back of your walking foot with a spring clip and gives you an adjustable guide on each side. This one says you can attach it either on the left or the right. Your walking foot also needs to have a flat back of at least 1/2”. That’s it! You’ll have to reposition the tape if you want to move the guide over but for less than a dollar I’m not complaining. Here are some pictures of it on my machine. 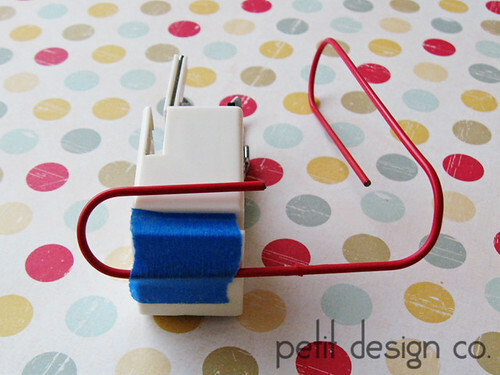 The curved end of the paper clip guarantees that you won’t snag your quilt sandwich as you go. The paper clip is actually pretty sturdy so unless you’re really wrestling your sandwich around I don’t think you’ll accidentally bend it out of shape. Thank you for researching and posting that information! 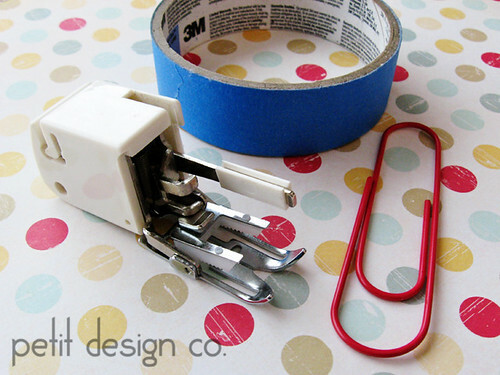 I will definitely use the paper clip idea soon as I was going to use the guide bar on the quilt I'm working on now. Well, I find that fascinating. I have used my quilting bar only once because like you said, I have to put all the bulk of the quilt into the harp area. Why is it designed like that??? I like your solution and will give it a shot. 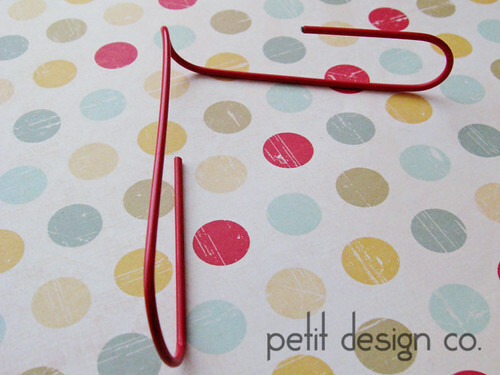 I love the clever idea with the paper clip! Great idea!! now I am off to find a paper clip in my messy office! I have that first one and it does work for me. But I don't use a regular walking foot anymore since my machine has a built in one, and that gadget doesn't fit on my built in one. I'm going to try the paper clip trick-thanks for the idea! 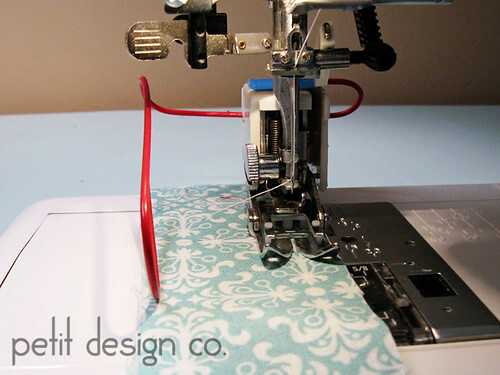 I've used a bar like that since my first treadle sewing machine! They're great for faux chenille blankets too. Thanks for this series! I don't think mine came with An "L" bar, thanks for the DIY. My machine will allow me to attach the quilting bar to the left side- upside down, but it still works. I broke the plastic part of my walking foot where the bar attatches (and am too cheap to buy a new one!) so I'm anxious to give the paper clip a try. Oh my gosh! This is awesome! 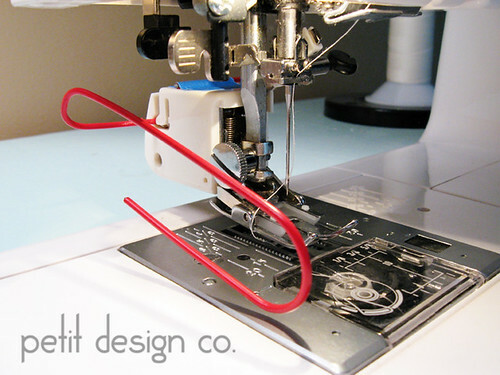 I just bought a new machine--that comes with a funky walking foot that hooks up electronically and blocks out the stitch I wanted to use. SO I bought a traditional foot-then didn't notice until I got home that it doesn't have a guide bar. I am going to try the paper clip for now. THanks! I just started to quilt my 2nd quilt. For 1st one, I used blue tape. It took forever and I had to figure extra 1/4". 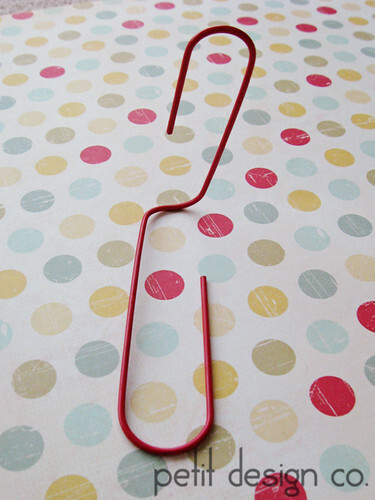 Thank you, thank you so much for the paper clip idea. It is wonderful. So glad I found your blog. I know this an old post and you may never read this but thank you so much for the paper clip idea. I bought a walking foot that didn't come with a guide. I didn't do the proper research and didn't think I would need a guide. I started and have nearly finished my first rag quilt and see how handy that little guide would come in. Your post popped up first when I typed in DIY walking foot guide and I am so grateful. Have a great day. This is a wonderful idea!!! Thank you so much. I just quilting a quilt with parallel lines and had so much trouble. My bar did fit on the opposite side but upside down and did not touch the quilt so I was guessing and had to really watch. This is so smart!! And I love cheap! 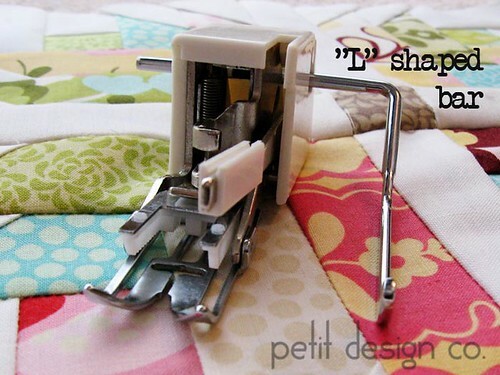 My machine will also allow me to attach the quilting bar to the left side- upside down, but it still works.